Unconfirmed buyout rumors are at play. Here's why it's an attractive takeout target. 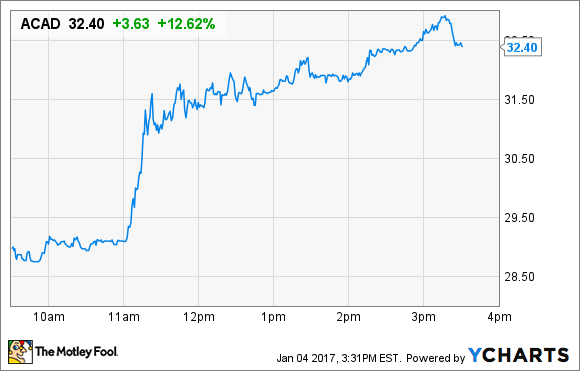 Shares of ACADIA Pharmaceuticals Inc. (NASDAQ:ACAD) popped just ahead of lunch on Wednesday, and have risen about 12.6% as of 3:31 p.m. EST. An unconfirmed rumor that Pfizer is interested in acquiring its set-to-explode antipsychotic drug, Nuplazid, is responsible for the pop. ACAD Price data by YCharts. Although it's just an unconfirmed rumor, Pfizer has been in an acquisitive mood. Given its $14 billion offer for Medivation in August, mostly for prostate cancer drug Xtandi, it seems not to be worried about paying premiums, either. Even tacking on a Pfizer-esque premium to ACADIA's modest $2.7 billion enterprise value, the company might be a value opportunity. Its lead drug, Nuplazid (pimavanserin), has a chance of treating a much wider range of patients, including the rapidly expanding population with Alzheimer's disease. Since launching the freshly approved antipsychotic treatment for the underserved Parkinson's disease population in May, the company has yet to report meaningful revenue figures. The first shipments didn't go out until late May, and by the end of September, ACADIA had recorded just $1.9 million in deferred revenue related to its sales. There's a worthwhile debate over just how well this antipsychotic can perform both in the Alzheimer's population and in the commercial setting as a whole. Statistically speaking, it significantly reduced patient psychosis (as measured by Neuropsychiatric Inventory-Nursing Home inventory scores), but by a slim margin. There's reasonable doubt that the results seen in the 180-patient phase 2 study can be repeated in a larger study, which will likely be necessary to support an FDA application for expansion from Parkinson's to Alzheimer's. On the other hand, there is a dearth of effective antipsychotics with minimal anticognitive side effects; additionally, a first approval tends to smooth out the path for a second. Looking a bit further ahead, clinical trials with Nuplazid in major depressive disorder and schizophrenia could push the stock even higher, regardless of Pfizer's intentions.